Online retailers, including auction giant eBay, are unhappy with three bills being introduced in Congress this week. The bills are intended to give police more authority to fight organized retail theft, but e-merchants say they're being singled out. "These bills are less about fighting shoplifting and more about big-box retailers wanting to crush legitimate small-business online competition that delivers real value and greater choice to consumers," says Tod Cohen, eBay's deputy general counsel. If passed, retailers would have to monitor and report suspicious activity, as well as keep a record of high-volume sellers for a minimum of three years. Organized retail crime would also become a federal offense and Internet companies could be held responsible for allowing stolen goods on their sites if they could have prevented it, according to reports. Cohen says law enforcement already has easy access to eBay and other online merchants and the bills are "anti-competitive." "We're very concerned about wild-goose chases and harassment of our sellers," he asserts. Online marketplaces and auction sites, as well as flea markets and swap meets are popular venues for criminals to sell merchandize, according to Joe LaRocca, the National Retail Federation's vice president of loss prevention. 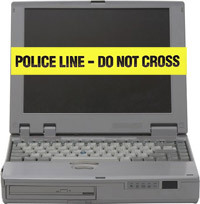 The FBI estimates that every year organized crime costs retailers between $15 billion and $30 billion. And according to the NRF, about 85 percent of online retailers it surveyed in 2008 had been affected by organized retail crime. Respondents also said that about 40 percent of items sold on auction sites and advertised as "new in box" were stolen or obtained in another illegal manner. The current economic climate is increasing the demand for new products at low priceswhich has resulted in more organized retail crime, the NRF reports. Some high-demand "hot" items include video games and handbags, which thieves can easily resell. "Unfortunately consumers and the economy are fueling a drive for this illegal or anonymous commerce that is taking place across the country," LaRocca notes in reports. Crimes at brick-and-mortar shops have also increased as stores reduce their staff to cut costs. And supporters claim the new billsintroduced by Sen. Richard Durbin and Reps. Brad Ellsworth and Jim Jordanwill help lower crime rates all around. "The online auction sites will tell you that they're complying, but there's no requirement and until they're under some kind of court order or subpoena; there's no incentive to comply," Ellsworth notes. "We don't want to put them out of business. We just want to stop criminals."